When the students were preparing the leaflets, did you feel their idealism would crack under the realism of the threat of execution? What set them apart from typical youthful idealists? How did their educational background contribute to their character formation? Do you think they knew they would likely get caught and pay such a high price? How do the physical surroundings of the movie relate to the film's meaning? What could the knocking of the pamphlets over the balcony symbolize? What is your impression of Mohr, the interrogator? Is he a guardian spirit or a tormentor? In what way does the interrogation scene mirror Pilate and Jesus? Why is the lavatory scene - when she removes her hairclip - pivotal to the plot of the movie? Is there any moment in your life where you can say “I don’t regret it. I’m willing to accept the consequences”? Why does Mohr become increasingly uncomfortable in condemning Sophie? Germany under the Nazis has often been accused of not having any noticeable noticeable resistance movement (unlike Poland and France). Does this movie help explain why? What role does faith play in Sophie's understanding of resistance? The 'White Rose' isn't a typical name for a political movement. What do you think it meant? 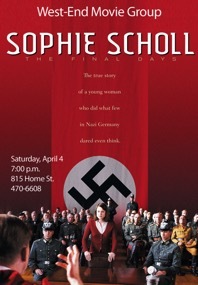 A reviewer has said that Sophie could almost taste freedom at the end. Is it possible she experienced freedom in fact? What is the danger in calling Sophie and Hans Scholl heroes? Does the 'global war on terror' resemble Nazism in any respect?